It’s exciting and fun for most parents-to-be to shop for nursery furniture, onesies and perhaps even changing tables. Buying an infant car seat, though, is more of a chore than a joy – but it’s one of the most important choices that expectant parents must make. When a newborn is in their arms they can exercise all the care and delicacy humanly possible, but once the baby is secured in the back seat of a car, the safety and security of their precious infant completely depends on a car seat made of 20 or 30 pounds of steel, aluminum and padding. That product had better be up to the task. Even those who are expecting their first child know two things: infants must be secured in a rear-facing car seat until they become toddlers, and that the most vulnerable part of a baby’s body is the head. For those reasons, safety tests place special focus on how well infant seats protect the head, but they also consider full-body protection. One other issue that’s not often front-of-mind, how well the carrier portion of the seat (the part that can be removed and either placed into a carriage or held separately) attaches to the permanent base, also factors in. Many organizations test all of these issues, but in ranking the top 5 infant car seats we’ve placed special importance on the testing performed in the Consumer Reports laboratories. They regularly update the simulations they conduct in order to mimic real-life safety challenges, and are more rigorous in their testing than just about anyone else. We also consider other attributes of the car seats we look at, including ease of installation, comfort, convenience – and of course, price. You can read our Best Infant Car Seat Buying Guide here. Now, let's go to our choices for the top 5. This car seat from Chicco isn’t the most expensive rear-facing seat you can buy for your infant. It’s just the best. The KeyFit 30 is an updated version of the company’s venerable KeyFit model, upgraded to accommodate infants weighing up to 30 pounds. And like its predecessor it grades out at the top of the safety rankings from Consumer Reports, and has earned an Editor’s Choice award from Baby Gear Lab and a host of other organizations. Most parents will be using government-mandated LATCH anchors to secure the base of their infant seat, and thankfully the Chicco is much easier than many competitors to install with those connectors, with just one middle strap (instead of the commonly-used side straps) to make any necessary adjustments once the base is in place. There’s also a handy bubble level integrated into the seat, to make it easy to tell if the seat is installed at the right angle. The task is tougher when using a rear seat belt to secure the base, and even more difficult if just installing the seat without the base (for example, in a friend’s car or taxi), but that won’t be a major factor for most people. The seat inserts into and releases from the base extremely easily, and is compatible with Chicco strollers and travel systems (as well as an inexpensive Chicco stroller frame) and many other leading brands of strollers. It’s time to look at safety. The KeyFit 30 is rated for infants weighing between four and 30 pounds, has a five-point harness and is lined with energy-absorbing foam as well as thick cushioning. As far as all-important head safety is concerned, this infant car seat ranked best in head protection and a large margin above US safety standards in several different reputable and independent tests. It also passes the eye test; when the baby’s strapped into the seat, you can tell there is quality protection. Adjustments are easy to make, for the most part, via a strap in the front of the seat and a one-touch harness release button. The shoulder straps are a bit more of a struggle to get just right, but no worse than most other infant seats we’ve seen. There are three handle positions, controlled via two levers. The seat isn’t particularly heavy, at 10.5 pounds, and the only real objection you might have is that the KeyFit 30 doesn’t look as upscale as some of the competition. At about $200, which is one-third lower than the prices of the high-end competition, that’s an easy “negative” to swallow. Here’s one that does look like a high-end rear-facing infant seat and carrier; it’s also priced like one and performs like one. The Cybex Aton 2 may need an adapter to work with non-Cybex strollers, but this model is worth the sacrifice. Let’s start with the sigh of relief you’ll feel when it’s time to install this seat. There are slim seat belt LATCH connectors and handy integral guides providing easy access to the connectors, and adjusting the straps is a breeze once they’re in place. If you’re using a seat belt to install the Cybex, there are color-coded markings to show you exactly where the belt should go. Installing the base of an infant seat is never easy; the Aton 2 makes it about as easy as possible. There’s a bubble level on the bottom, too. Once again, installing the seat by itself in another car can be a hassle – but that’s pretty common among most of the top models. If there’s a real downside to the way the base and seat are built, it’s that you often have to “fight” with the seat to get it in place so it clicks in securely. However, there’s an indicator that shows you when the seat is properly set. The Aton 2 ranked right alongside the KeyFit at the top of Consumer Reports’ safety rankings, ranks well above required U.S. safety standards, and has one nice feature that’s common to European car seats but not often seen in America: a load leg. This extends from the base to the car’s floor in order to prevent the seat assembly from rotating sideways in a crash. There are also fold-out side-impact devices which add to the infant’s security in the seat, and more than adequate padding throughout. This Cybex seat is easy to use, with two exceptions. The harness-tightening adjustment can require a little extra strength to pull the tightening strap, and you actually have to remove the shoulder straps and then rethread them in order to adjust their height which is annoying but thankfully doesn’t have to be done often. One other negative is that the canopy is quite small compared to competitive models. The Aton 2 is beautiful, safe and innovative. It also costs more than $300 – much more than the KeyFit but not an extraordinarily high price for a high-end infant car seat you’ll be using for several years. This relatively-new entry into the infant car seat market has made quite a splash. It does extremely well in safety tests, and unlike most competitors is designed to be convenient for those who use multiple cars or live in the city (and are dependent on taxis and Ubers) and have to regularly use the Mesa without the base. It’s another high-priced seat, but that convenience alone will make it worth the price for many buyers. The UPPAbaby base is as easy, or easier, than the Cybex and KeyFit to install permanently. For LATCH installations, there are self-ratcheting connectors which easily clip into the car’s anchors and snap into place. There are also buttons (which we love) to allow you to release or tighten the straps, plus a bubble level and a green light to show you when you’ve done everything right. Like most of our top-rated seats, there is a color-coded path to show you the right way to connect the base with a seat belt to make an always-difficult task a bit easier. 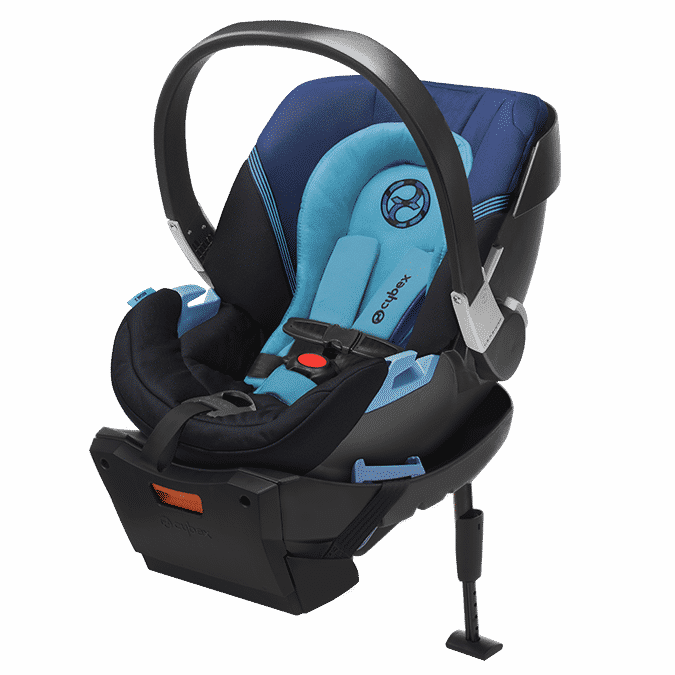 The belt path for using the seat without the base is also color coded, and takes just seconds – a noticeable difference from most baby seats which can take minutes to hook up in a cab. Putting the seat securely into the base is simple, requiring no jostling or playing around to get that “click” you’re waiting to hear. The safety scores for the Mesa aren’t as high as for the first two entries on our list of the top 5 infant car seats, but they’re still well above federal standards. There is also an adjustable head rest with extra head padding and side impact protection built into the seat. Adjusting the harness is no problem with the strap at the bottom of the unit, and you can change the shoulder height from the front of the seat without having to remove and rethread the straps. There are also two crotch positions, unusual for rear-facing infant seats. This seat has a hideway canopy with SPF 50+ protection which is better than most other competitors, and the fabrics and materials used for construction are higher-quality than on the Cybex. It works in conjunction with UPPA strollers (which are terrific), but will need an adapter for any chance of fitting other brands. This is another $300 model, but a very nice one with some terrific features. You’ve never heard of Peg Perego? Neither had we. But this Italian company’s rear-facing infant car seat is terrific. We rank it a bit lower because you’ll need an adapter to fit strollers other than the ones Peg Perego manufactures, and those strollers aren’t always available in stores. But don’t ignore this seat; it’s definitely worth your consideration. Installation is about as easy as with the other models we’ve looked at. There’s a “Right Tight System” with LATCH connectors that click into place and are fairly easy to loosen; adjusting the height is simpler than on most seats with the use of a twist-knob and the integral bubble level. There’s no color-coded path for seat belt connection, but the belt threads right through open slots so it’s still pretty easy. The seat clicks into place in the base without a fight. The Peg Perego is on a par with the UPPAbaby for use without the base, easily allowing a belt to thread through the back with color-coded guides. Safety metrics show this seat coming in above all federal guidelines and pretty close to most of the other top models on our list. There’s what’s called an “anti-rebound” bar at the bottom of the base that runs to the back of the vehicle, which supposedly secures it in tightly in crashes, and there is EPS foam to absorb the impact of a crash. The harnesses and shoulder straps adjust easily without rethreading, the seat is well-padded and well-constructed, and the entire system is quite attractive. Putting aside the compatibility issues, this is another good choice at the $300 level. We’re closing out our top 5 list with the lowest-priced model that offers good value. The Safety 1st seat doesn’t excel in any one category, but is well above average in most. Installation is with a one-touch LATCH system which the company says is “one-click,” but it’s slightly tougher to get things exactly right than some of the higher-priced seats and the base doesn’t feel quite as secure. The seat belt installation is more stable, although you do have to fiddle for a while to get the belt threaded properly. Using just the seat in a friend’s car or taxi is much easier. The seat clicks easily into place on the base. Safety is another category where the Onboard 35 Air was good but didn’t excel; the seat exceeded federal standards significantly in tests and ranked highly in protecting the head area, but overall it didn’t score as high as the seats above it on our list of top 5 infant car seats. There is an “Air Protect” cushion setup in the head area on this seat which is designed to absorb energy in a collision, which may be why the head protection tests came out better. All of the “user” features are also good but not spectacular. The harness tightens with a strap that’s a little difficult to pull, you have to rethread the harness when you make height adjustments, and the padding is adequate but definitely not luxurious. The biggest negative for the onBoard 35 is that it is not going to fit into most strollers. You’ll have to search for one that works with this seat, use an adapter, or just use a front pack carrier. The price of this model is around $140, and if accepting the trade-offs or middle-of-the-pack features are worth the savings to you, this is the best budget option you’ll find.